In the first round of the 2010 Stanley Cup Playoffs, the second seeded Blackhawks were in a dogfight against the Nashville Predators. After winning Game 4 in Nashville, the Hawks tied the series 2-2 going into Game 5 back in Chicago. Game 5 was pivotal for obvious reasons, the winner would have control of the series going back to Nashville with a chance to close it out. I remember this as the first “big” Blackhawks game of this recent era that aired on national television on NBC. All eyes were on the United Center. When monumental, series-changing, “life-altering” sporting events happen you always can remember where you were… For me, a room at a Holiday Inn at ISU in Normal, Illinois. The Hawks got out to a 3-1 lead midway through the second period, and looked like they were on their way to easily winning the game. But Nashville fought back. A shorthanded goal by Joel Ward made it a 3-2 game at intermission, and a pair of tallies by Martin Erat in the third gave the Preds a 4-3 lead late in the game. With just over a minute left, Marian Hossa violently checked defenseless Predators player Dan Hamhuis into the boards from behind. Hossa received a five-minute penalty, but no game misconduct. Now down 4-3 with a minute left, the Blackhawks were shorthanded. It looked like the Hawks were going to be facing elimination in a must-win Game 6 in Nashville two nights later… But with 14 seconds left in regulation Patrick Kane became the first hero of the game, tying it 4-4 with seconds left to force overtime. The UC was going bonkers, but Marian Hossa would be in the penalty box for four minutes of overtime. Before I talk about the goal, can we all agree how hilarious it was that Doc Emrick yelled “KANE!! !” after Hossa scored. One of the biggest goals ever and Doc calls the wrong player’s name. For me, it just adds to how special the moment was. Hossa, after being the goat who took the dumb penalty at the end of regulation, leaves the box and goes straight to the net and taps home the game winner to become the hero of the series. Couldn’t write that any better in Hollywood. It was the perfect ending to a game that was filled with so many ups and downs. As I said at No. 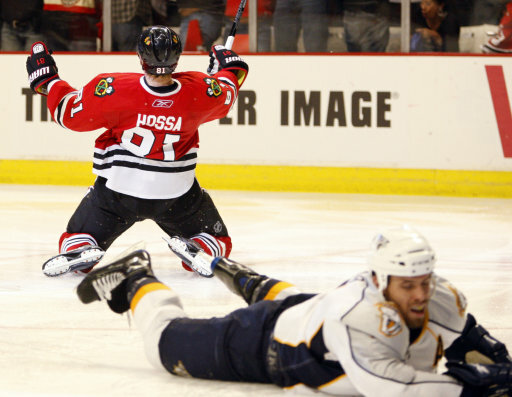 10 in our countdown (Kane’s tying goal), it’s not crazy to say that without Hossa’s OT winner the Blackhawks possibly don’t win the Stanley Cup in 2010. This game showed everyone that this young Blackhawks core really had something special brewing. The response to Hossa’s game winner in Nashville was one filled with hate and anger, and it was probably justified. Predators staff and fans complained endlessly about how Hossa should have gotten a game misconduct (kicked out of the game) for his hit on Dan Hamhuis. Preds fans claim if Hossa had gotten a misconduct he wouldn’t have been on the ice in overtime to score the game-winner, and Nashville could have won. Either way you see it, the referee made the call, Hossa stayed in the game, and the rest is history. Hossa was mercilessly booed whenever he touched the puck in Game 6 in Nashville. The Blackhawks went to the Music City after their improbable Game 5 win and took it straight to the Preds, winning the game 5-3 and clinching the series. The Blackhawks would survive the Nashville series, and go on to win their first Stanley Cup in 49 years. Looking back today, the Nashville series in 2010 was one of the most difficult the Hawks had to go through in the last six years, and Game 5 was arguably the best playoff game of that time period.